I entered into the realm of “RV pilot” on February 12, 2006 by making the first flight of my RV-10. I spent a little less than 25 months and approximately 1700 hours on construction, using a Standard Kit with the QuickBuild fuselage option. When I began the process, I thought of construction only as a means to an end. Somewhere along the line I became attached to my handiwork, and the building itself became a passion, and completion the realization of a personal dream. It became even more fulfilling when I began to understand the opportunities that our two daughters (ages 2 and 4 when construction began) would realize both during and after construction. With this motivation and family support, I was able to complete the project in a short time. One of the most important benefits of a kit airplane is the ability to build it to your requirements. It’s a highly individualized process. You get to decide — sometimes agonize — over every aspect of making your plane fit your unique needs. My goal was a well-equipped, technically advanced, cross-country aircraft, capable of covering large distances comfortably and safely. We outfitted our RV-10 with advanced avionics that provide navigation, in-flight weather and traffic displays, autopilot, and much more. These have served us well on nearly all of our long-distance travels. The RV-10 is a very stable and smooth airplane in cruise, and provides such phenomenal climb performance that even on the hot summer days you are quickly out of the turbulence and heat and settle in for a comfortable cruise. The exceptionally clean airframe allows both speed and efficiency. I lean the IO-540 aggressively and it’s not unusual to see a range of over 900 or even 1000 nm displayed on my EFIS at cruise settings. That’s while maintaining between 160 and 170 knots of true airspeed. Our standard profile is to jump in, climb to somewhere between 8500’ and 14,000’, lean the fuel flow to between 8 and 10 gph, and settle in. The kids are fully occupied in the back seats, watching movies. It’s about 6.5 hours from Minneapolis to Disney World. With one stop in the middle, that’s a very bearable day of flying. 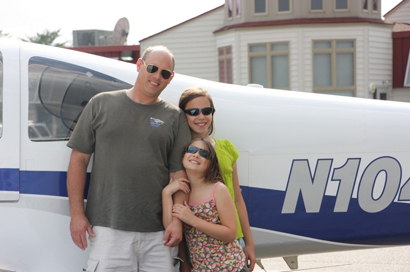 In our first year as a flying RV family, we’ve given our kids experiences that will stick with them forever. There was the inaugural flight to Disney World, a promise to the kids used as motivation during construction. Then a long weekend in Yellowstone Park, which was a quick and easy trip from Wisconsin in an RV. Next was a trip to Oregon, for Van’s Homecoming and to see the Pacific Ocean. The kids even learned to pronounce it “Ore-eh-gun,” just like the locals! And later in the season we really stretched the RV-10’s legs: we flew to Albuquerque for the Balloon Fiesta, attended the Land of Enchantment RV fly-in in Las Cruces, then went on to a spectacular overflight of the Grand Canyon. On the way home came the most spectacular day of IFR flight that I’ve ever had. We departed El Paso, using in-flight weather to avoid various towering cells, and on to a very fulfilling instrument approach into our fuel stop on our way home.